The wine cups are made of 304 stainless steel, more durable than other ordinary glasses; And they are not easy to be broken; You can use them to store any beverage such as wine, beer, water and so on; Moreover, they are easy to clean. The ergonomic design allows you to hold your wine cups effortlessly; And the double insulated technology is good for keeping your drinks warm for a longer time in a cold day, providing you a warm winter, you will love them. 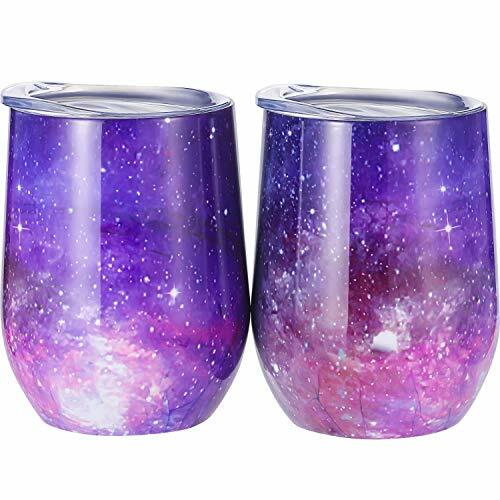 These wine tumblers look fantastic with beautiful color and delicate design, wonderful gifts for your friends, family members and so on. Wash these cups with sponge cloth or sponge ball dipped into warm water. There is a straw hole on the lid, please do not invert the cup to avoid pouring. Advanced insulation technology: the double insulated technology is good for keeping your drinks warm or cold for a longer time, so you can use it in any season. If you have any questions about this product by Skylety, contact us by completing and submitting the form below. If you are looking for a specif part number, please include it with your message.